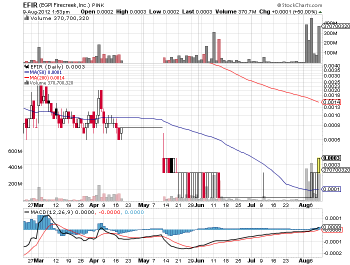 Micro penny stock EGPI Firecreek, Inc. (EFIR) has doubled in today’s trading session amidst heavy volume. Things really began picking up for the Company on August 3 in conjunction with a amended 8k filing, which you can see by clicking here. EFIR announced earlier this month that it has finalized its sale for a portion of its oil & gas interests to Mondial Ventures, Inc. (MNVN) for $1.15 million in a share issuance. As previously reported, EGPI had entered into an Agreement to sell a portion of its working and net revenue interests to Cubo Energy, PLC. Recently, Cubo authorized the assignment of the Agreement over to U.S.-based Mondial Ventures, Inc. who has recently completed the transaction. Terms for the purchase of the North 40 acres of the J.B. Tubb Leasehold Estate/Amoco Crawar field consists of a 37.5% working interest (“WI”), 28.125% net revenue interest (“NRI”) in the oil and gas interests, and pro rata oil & gas revenue and reserves for all depths below the surface to 8500 ft. including all related assets, fixtures, equipment, three well heads and three well bores. The field is located in the Permian Basin and the Crawar Field, which is directly adjacent to property operated by Chevron Corporation in Ward County, Texas (12 miles southeast of Monahans and 30 miles west of Odessa in West Texas). Based on engineering reports, the working and net revenue interests carry a gross value of $1,150,000. Currently, there are three wells in operation on the property currently producing approximately 300+ barrels of oil per month. Plans are to immediately increase and stabilize oil and natural gas production, thereby increasing initial production to approximately 900 to 1000 barrels of oil per month, with additional anticipated oil production increases, as the remedial work programs progress. Mondial Ventures initially plans to exercise one of its options by providing $1.575 million, raised on a best efforts basis, for Capital Expenditures (“CAPEX”), for the drilling of an Ellenburger Well located on the South 40 acreage. The work program calls for drilling down to an 8,300 ft. depth on a turn-key basis. Public Records reveal an average production rate of 240 barrels of oil per day for Ellenburger wells on properties adjacent to the South 40 acreage that are currently owned by Chevron, BP and McCulloch Oil Corp. of California. Under terms of the finalized Agreement Mondial Ventures has assumed $450,000 of oil and gas related liabilities from EGPI Firecreek. Additionally, EGPI Firecreek shall retain a 37.5% WI and 28.125% NRI for any future development and drilling oil & gas work programs with Mondial Ventures. EGPI/Firecreek, Inc. formerly known as Energy Producers, Inc. is an oil and gas production company focusing on the recovery and development of oil and natural gas. This strategy is centered on rehabilitation and production enhancement techniques, utilizing modern management and technology applications in upgrading certain proven reserves. Firecreek is now a wholly-owned subsidiary of EFIR, and is the oil and gas operating arm of EFIR. EFIR is responsible for overall management, financial resources and the administration of securities and exchange functions while Firecreek handles all operational duties including negotiations, drilling, rehabilitation and related projects. Bottom Line: It all sounds good. However, according to a 10Q filing on May 14, 2012 MNVN had a cash position of $104.00. It would seem that Mondial Ventures has its work cut out to raise the $1.575 million on a “best efforts” basis. We would be wary of the hype here until there is more in the way of financing commitments. Last updated by Michael Adams at August 9, 2012 .